In the fall of 2014, business people, scholars, and theologians converged on the campus of Calvin College in Grand Rapids, Michigan, for the Symposium on Common Grace in Business. The event was conceived and co-sponsored by the Calvin business department and the Acton Institute as a way of highlighting Abraham Kuyper’s theological work on common grace – the grace God extends to everyone that enables him or her to do good – to the business world. The gathering was also a celebration of Acton’s translation and publication in English of volume one of Kuyper’s seminal three-volume work on common grace (De Gemeene Gratie). 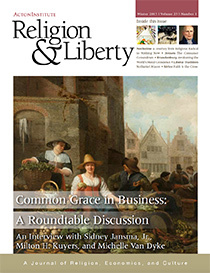 We’re leading this Winter 2015 issue of Religion & Liberty with a roundtable discussion by three prominent business people who discuss how common grace has a direct, and transformative, application in their workaday lives. Also in this issue, Ray Nothstine reviews Thomas C. Oden’s autobiography A Change of Heart: A Personal and Theological Memoir. The book chronicles how one of the twentieth century’s most celebrated liberals made a dramatic turn away from pacifism, ecumenism and psychotherapy toward the great minds of ancient Christianity. Critics of the market economy often say it inevitably leads to Black Friday stampedes and gross materialism. We counter with an excerpt from Rev. Gregory Jensen’s forthcoming Acton monograph The Cure for Consumerism. Raphael Lemkin was a largely unknown Polish-Jewish lawyer who coined the word “genocide” and almost single-handedly lobbied the United Nations to make it a crime in 1948 under international law. Matthea Brandenburg reviews Watchers of the Sky, a new documentary detailing his story which also reminds us that many of history’s atrocities have gone largely unnoticed. 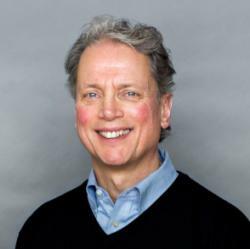 In the Acton FAQ, Executive Director Kris Mauren describes an innovative new program to equip workers in the mission field with resources from the PovertyCure initiative. The PovertyCure Outreach Program aims to transform the thinking among short and long term missions’ workers, empowering missionaries and volunteers from an aid to a trade mindset. The goal is to influence one million current and future missionaries over the next two years. In the Liberal Tradition examines the life of Nathaniel Macon (1757-1837), a vigorous dissenter of centralized power and federal expenditures from North Carolina. The Double Edged Sword tackles the problem of evil and suffering in a commentary on Psalm 53: 2-4.